1Former President Kumba Ialá decided to change the capital city to Buba, but this is unlikely to occur. Guinea-Bissau, officially the Republic of Guinea-Bissau (pr. gin-ee-bi-sou. Portuguese: 'República da Guiné-Bissau', IPA: [ʁɛ'publikɐ dɐ gi'nɛ bi'sau]), is a country in western Africa, and one of the smallest nations in continental Africa. It is bordered by Senegal to the north, and Guinea to the south and east, with the Atlantic Ocean to its west. 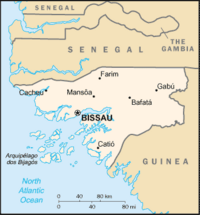 Formerly the Portuguese colony of Portuguese Guinea, upon independence, the name of its capital, Bissau, was added to the country's official name in order to prevent confusion between itself and the Republic of Guinea. Guinea-Bissau was once the kingdom of Gabù, part of the Mali Empire; parts of the kingdom persisted until the 18th century. Although the rivers and coast of this area were among the first places colonized by the Portuguese, who began slave trade in the 17th century, the interior was not explored until the 19th century. An armed rebellion beginning in 1956 by the African Party for the Independence of Guinea and Cape Verde (PAIGC) gradually consolidated its hold on the country. Unlike other Portuguese anticolonial efforts, the PAIGC rapidly extended its military control over large portions of the country, aided by the jungle-like terrain and large quantities of arms from China, the Soviet Union, and other African countries. The PAIGC even managed to acquire a significant anti-aircraft capability in order to defend itself against aerial attack. By 1973, the PAIGC was in control of most of the country. Independence was unilaterally declared on September 24, 1973 and was recognized by a 93-7 UN General Assembly vote in November 1973. , Recognition became universal following the socialist-inspired military coup in 1974. The country was controlled by a revolutionary council until 1984. The first multi-party elections were held in 1994, but an army uprising in 1998 led to the president's ousting and the Guinea-Bissau Civil War. Elections were held in 2000 and Kumba Ialá was elected president. In September 2003 a coup took place in which the military arrested Ialá on the charge of being "unable to solve the problems." After being delayed several times, legislative elections were held in March 2004. A mutiny of military factions in October 2004 resulted in the death of the head of the armed forces, and caused widespread unrest. In June 2005, presidential elections were held for the first time since the coup that deposed Ialá. Ialá returned as the candidate for the PRS, claiming to be the legitimate president of the country, but the election was won by former president João Bernardo Vieira, deposed in the 1998 coup. Vieira was a candidate for one sect of the PAIGC. Vieira beat Malam Bacai Sanha in a runoff-election, but Sanha refused initially to concede, claiming that the elections have been fraudulent in two constituencies, including the capital Bissau. Despite reports that there had been an influx of arms in the weeks leading up to the election and reports of some 'disturbances during campaigning' - including attacks on the presidential palace and the Interior Ministry by as-yet-unidentified gunmen - European monitors labelled the election as "calm and organized". Guinea-Bissau has a multi-party National People's Assembly as well as a president, both of which are elected by popular vote. The president appoints the prime minister after consultation with the parties in the assembly. The former president, Kumba Yala, belongs to the Social Renovation Party or PRS; other parties in the assembly include the Guinea-Bissau Resistance and PAIGC. 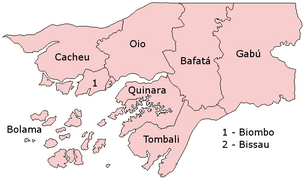 Guinea-Bissau is divided into 8 regions (regiões) and 1 autonomous sector (sector autónomo), and are subdivided into 37 sectors. At 13,945 sq mi. (36,120 km²) Guinea-Bissau is nearly identical in size to Taiwan, and somewhat larger than the US state of Maryland. This small, tropical country lies at a low altitude; its highest point is 984 feet (300 m). The interior is savanna, and the coastline is swampy plain. Its monsoon-like rainy season alternates with periods of hot, dry harmattan winds blowing from the Sahara. The Bijagos Archipelago extends out to sea. Guinea-Bissau is among the 20 poorest countries of the world. Its farming and fishing economy was badly disrupted by the 1998–1999 civil war. It has a foreign debt of $US 921 million and is subject to an IMF structural adjustment program. One of Guinea-Bissau's important income sources is cashew nuts, of which it exports 90,000 tons per year. In January 2005 the government announced that a locust swarm was threatening this vital crop, and that the country did not have the resources to tackle the infestation. The population of Guinea-Bissau is ethnically diverse and has many distinct languages, customs, and social structures. Nearly 99% of Guineans are black and can be divided into the following three catergories: Fula and the Mandinka-speaking people, who comprise the largest portion of the population and are concentrated in the north and northeast; the Balanta and Papel people, who live in the southern coastal regions; and the Manjaco and Mancanha, who occupy the central and northern coastal areas. Most of the remaing 1% are mestiços of mixed Portuguese and black descent, including a Cape Verdean minority. Pure Portuguese comprise only a very small portion of Guinea-Bissauans. This deficit was directly caused by the exodus of Portuguese settlers that took place after Guinea-Bissau gained independence. More than 90% of the population speak African languages, the most popularly spoken of which is Kriol, a Portuguese-based creole language. Its usage constitutes some 44% of Guinea-Bissau's verbiage. In contrast, the official language, Portuguese, is spoken by only 14%. Most people are farmers with traditional religious beliefs ( animism); 45% are Muslim, principally the Fula and Mandinka peoples; and less than 8% are Christian, most of whom are Roman Catholic. Music of Guinea-Bissau is usually associated with the polyrhythmic gumbe genre, the country's primary musical export. However, civil unrest and a small size have combined over the years to keep gumbe, and other genres, out of mainstream audiences, even in generally syncretist African countries. The calabash is the primary musical instrument of Guinea-Bissau, and is used in extremely swift and rhythmically complex dance music. Lyrics are almost always in Capeverdean Crioulo (Kriolu), a Portuguese-based creole language, and are often humorous and topical, revolving around current events and controversies, especially AIDS. The word gumbe is sometimes used generically, to refer to any music of the country, although it most specifically refers to a unique style that fuses about ten of the country's folk music traditions. Tina and tinga are other popular genres, while extent folk traditions include ceremonial music used in funerals, initiations and other rituals, as well as Balanta brosca and kussundé, Mandinga djambadon and the kundere sound of the Bijagos islands.